Now that you’ve unpacked your bags, fallen back with that extra hour of sleep and as you begin looking through your notes, we want to be sure you know just where you can find all of the great resources from WCET12. Did you miss a general session or the WCET Smackdown, powered by Pecha Kucha or want to share the learning with your colleagues? Have no fear! Our sponsor, Mediasite by Sonic Foundry, has captured all of these sessions and has them archived on the 2012 WCET Annual Meeting Page. Be sure to share Jane Bozarth’s Toys to Tools with any social media naysayers in your organization so they too can learn that twitter, Facebook and YouTube are NOT just for cats, cookies and knitting. And speaking of social media, did you follow the twitter stream? Search #WCET12 on twitter to find what the learning nuggets your colleagues broadcast through that channel. 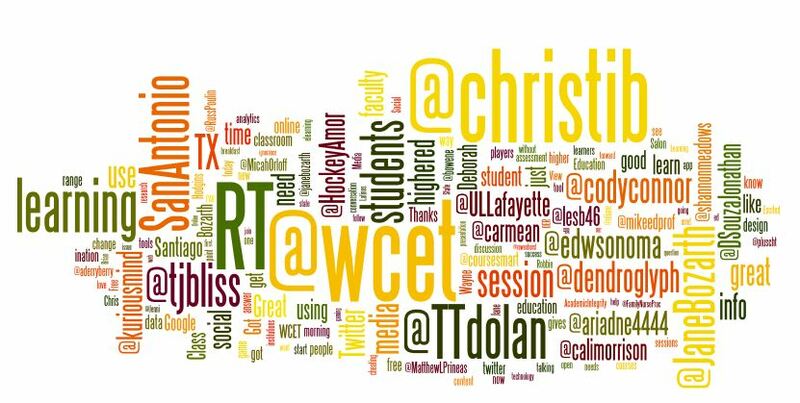 Just for fun, we made a wordle of the tweets and tweeters from #WCET12. We’d also like to invite you to connect with your cooperative on Facebook. We have a page for the cooperative and for the WCET Annual Meeting. Presentation materials provided by our speakers can be found on our WCET Slideshare Page. If you have slides you’d like added, it’s not too late! Please email wcetconference at wiche.edu (@ replaced to avoid spam bots!). What are your “AHA!” moments from WCET12? We’d love to hear them in our comments, on our Facebook or via email. And if you blogged about your experiences, please share the link in the comments or email it to Cali Morrison (cmorrison at wiche.edu). While you’re in a sharing mood, please be sure to fill out the WCET 2012 Annual Meeting survey, if you haven’t already. We really do consider your comments in planning for future annual meetings. 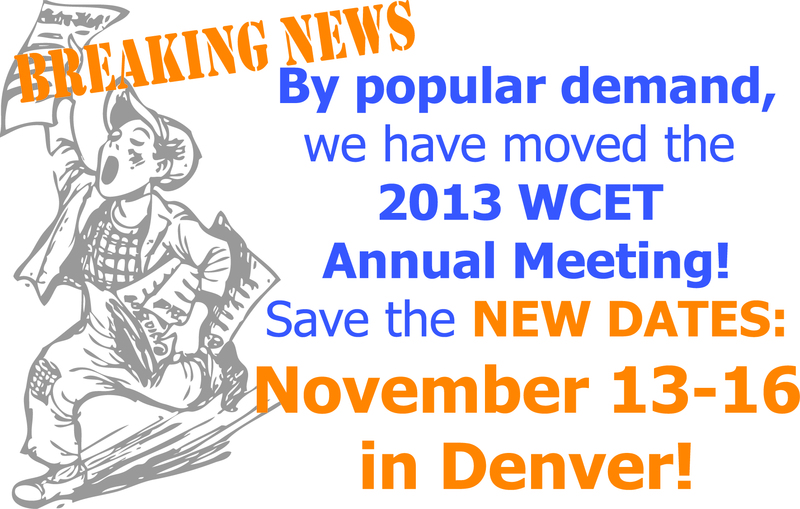 And last but not least, don’t forget to update your calendars for the 25th WCET Annual Meeting November 13-16, 2013 in Denver, CO. We hope to see all of you there as we reminisce over a productive 25 years and set forth toward the future of your cooperative, WCET, over the next 5, 10, 25 years!